Twice a year, in October and May, NFWS partners with the Burchfield Penney Art Center to host a demonstration by the NFWS Workshop Artist. 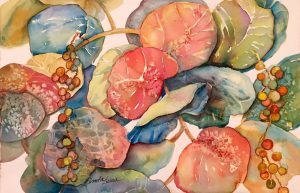 Our Fall Workshop Artist is stunning water media artist renowned for her beautiful floral paintings, Linda Lucas. Come to the BPAC early, check our the exhibitions, and the gallery shop. All are welcome! Linda Lucas graduated from Rochester Institute of Technology with a Fine Arts degree & also attended NYS University @ Elmwood for Fiber Arts & Surface Design. After college she was an artist/ illustrator for Rochester Board of Education & was part owner and manager of an FTD florist for over 25 years. Linda taught in Florida at Ringling School of Art at Longboat Key , Keetons, and Art Center Manatee. She also taught at Chautauqua Institution in New York State. Her workshops in watercolor, acrylic inks and painting on silk are available around the United States. Linda participates in juried fine art outdoor shows year-round & has received numerous awards including best of show in New York & Florida as well as first place this year at the Allentown Art Festival. Her work is available at Art Loft & Art Loft 2 , Chautauqua NY; Stangler Fine Art Gallery in Orchard Park NY & Florida Craft Art Gallery St Petersburg Fl. She is an active member of various art organizations including FSWS , FWS and NFWS. Linda is inspired by nature and expresses that love through her paintings celebrating bright colors, shapes & surfaces that are woven together to create engaging forms in both traditional and impressionistic joyful art.